After helping lead their respective teams to series wins against top opposition, TCU senior righthander Preston Morrison (Waxhaw, N.C.) and Florida sophomore centerfielder Buddy Reed (Finksburg, Md.) have been honored as the headliners on the CS360 week-2 Primetime Performers Honor Roll. Morrison is the CB360 National Primetime Pitcher of the Week and Reed the Primetime Player of the Week, following their week-2 contributions – with 13 others rounding out the Primetime Performers Honor Roll for Feb. 16–22, 2015. 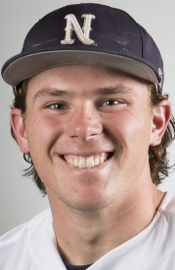 In addition to Morrison and Reed, the other week-2 Primetime Performers include: Nevada sr. 3B/1B Austin Byler (Peoria, AZ) … Oklahoma jr. 2B/1B/LF Kolbey Carpenter (TX) … Cal fr. 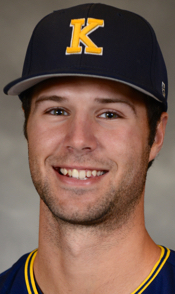 C/DH Brett Cumberland (Turlock, CA) … Indiana State fifth-year senior LHP Jeff Degano (Surrey, BC) … Houston so. 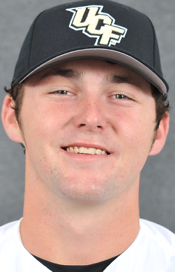 RHP Andrew Lantrip (Livingston, TX) … jr. LHP Ryan Lawlor (Savannah, GA) … UCF fr. 2B/RHP Kyle Marsh (Port Orange, FL) … Missouri jr. RHP Reggie McClain (Duluth, GA) … Grand Canyon jr. SS Paul Panaccione (Peoria, AZ) … Kent State sr. SS Sawyer Polen (Wooster, OH) … Florida Atlantic jr. LHP Brandon Rhodes (Lake Worth, FL) … Wright State jr. RHP Jesse Scholtens (Fairfield, CA) … and Arkansas State so. 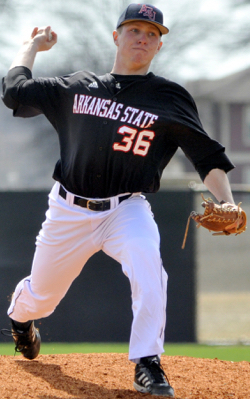 RHP Tyler Zuber (White Hall, AR). 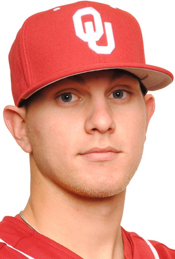 MORRISON – who formed a potent 1-2 punch with LHP Brandon Finnegan on TCU’s 2014 College World Series team (Finnegan went on to pitch in the MLB World Series as well, with the K.C. Royals) – sparkled in the series opener versus Arizona State (cb360 #17), fashioning a three-hit shutout as the Frogs won 3–0 in Phoenix. 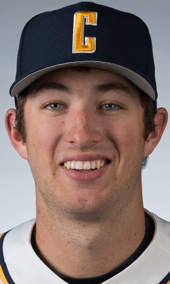 After working around a couple baserunners in the first frame, the 6-foot-1, 185-pound right-hander yielded only two hits over the final eight innings. 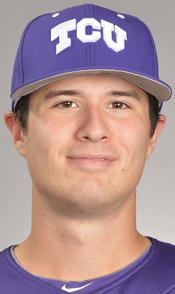 TCU senior Preston Morrison delivered on the big stage, fashioning a 3-hit shutout versus Arizona State in Phoenix – sparking the Frogs to a quality early-season series win. Only one of ASU’s four baserunners ventured into scoring position, while Morrison retired 23 of the final 25 batters he faced. He walked only one batter and struck out five, while returning 15 others via groundball outs. 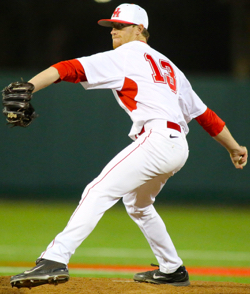 The big-game win was the senior’s 27th career victory at TCU, his eighth complete game and – most impressively – his fifth shutout performance. REED hit .444 (8-for-18) during the four-game week while helping the Gators win the three-game weekend rivalry series versus Miami (cb360 #11). The switch-hitter made key contributions all week from the 2-hole – ranging from four RBI and three runs scored to four stolen bases and even a pair of assists from his spot in center field. In the tight 4–3 opener against the Hurricanes, Reed hit 3-for-5 with a pair of stolen bases while scoring to tie the game in the 6th inning, in addition to later gunning down Miami’s own potential tying run in the 8th – and finally delivering the single that scored Josh Tobias for the thrilling win. 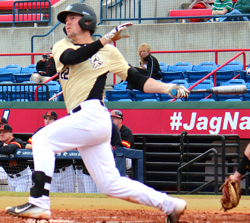 Two days later, in the low-scoring series finale (a 2–1 Gators win), the 6–3, 200-pounder tied the game with a clutch, two-out single to right field in the 3rd inning. 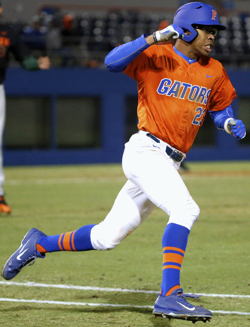 Florida sophomore centerfielder Buddy Reed led the way for the Gators in a rivalry series win over Miami plus a midweek victory over USF, batting 8-for-8 (4 RBI, 3 R) with several clutch hits, plus four stolen bases and even a pair of fielding assists. Prior to batting 5-for-12 in the showdown against Miami, with hits in all three games, Reed went 3-for-6 with a pair of RBI, two runs scored and a couple stolen bases in Florida’s 13–3 win over South Florida. 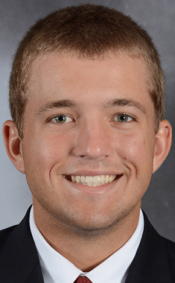 Primarily a starting corner outfielder as a freshman in 2014, Reed has unseeded Harrison Bader as the Gators starter in center field this season. 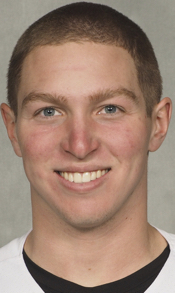 In his pre-college days, Reed was a three-sport standout at St. George’s School in Middletown, R.I. – but not in the usual football–basketball–baseball combination, but rather soccer, hockey and baseball. The 15 week-2 Primetime Performers include: eight pitchers (three of them LHPs) and a pair of shortstops, plus a catcher, corner infielder, centerfielder and two valuable utility player (one a 2B/RHP and the other a 2B/1B/LF). Six of the honorees are juniors, plus three seniors, three sophomores, a pair of freshmen and a fifth-year senior. The 15 include two each from hometowns in Arizona, California, Florida, Georgia and Texas – along with one each from Arkansas, British Columbia, Maryland, North Carolina and Ohio. 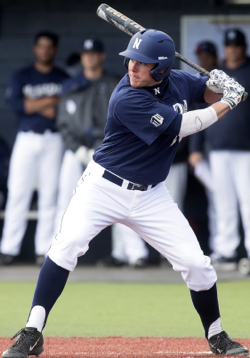 Key player in Nevada’s 7–0 record over the first two weeks of the 2015 season – the best start in program history … lefthanded power hitter who batted .400 during four-win week that included victory at Texas Tech (cb360 #9) and home series sweep of  Fresno State … launched a pair of home runs during the week while scoring seven times and driving in four runs … reached base 15 times during the week (4-for-10 with eight bases on balls and three HBPs) … hit 2-for-4 with a solo home run and another run scored in the 8–4 win at Texas Tech (the Raiders only loss so far in 2015) … his second home run of the week ended the 9–8 series opener vs. Fresno, in the 10th inning (he also walked and scored three times earlier in that game) … compiled a .733 on-base pct. 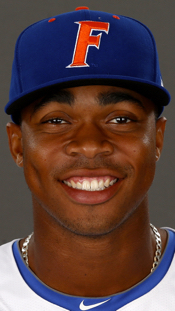 during the Fresno series, with 10 total free passes during those three games (seven walks and three times hit-by-pitch) … returned for his senior season, after being selected by the Washington Nationals in the 9th round of the 2014 MLB draft … four-year starter who hit .326 with a league-leading 14 home runs in 2014, en route to earning first team All-Mountain West Conference honors (also ABCA West Region second team) … hit .346 with 8 HR in 2013 … Arizona product from Sunrise Mountain High School. 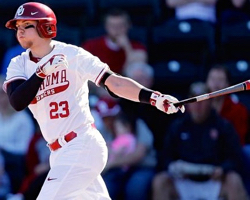 Provided the power for Oklahoma during bust week in Arizona, playing five games against various Pac-12 teams … hit 8-for-17 with three home runs, nine RBI and seven runs scored during that stretch, highlighted by wins over Washington (cb360 #47),  Oregon State and Utah, plus a loss versus host  Arizona State … filled in wherever needed defensively (first base, second and left field) during the busy week … slugged nearly 1.200 during the week, with his five extra-base hits also including a triple and a double (five of his eight hits carried him beyond first base) … launched 3-run HR in 4th inning to spark 10–1 win over Washington, adding a two-run triple and run scored the next day (also in Surprise, Ariz.) during 9–6 win over Oregon State … closed the week with early game-tying blast against Utah and go-ahead, two-run shot versus the Utes (4–3 final) … collected hits and factored into at least one run in all five games, including 2-for-4 with a run and double in 7–4 loss to ASU (also 2-for-4 with an RBI in 4–3 loss vs. Washington State) … reached base 11 total times during the week, with a pair of walks (three runs scored) vs. Washington and one against Utah … entering his first season as a regular starting, after batting .300 in 26 games played during 2014 … Texas product from West High School. California … C/DH … Fr. 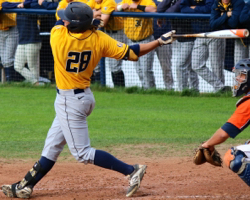 Switch-hitting newcomer who has made quick transition to the collegiate game and could emerge as a key factor for Bears surpassing expectations in 2015 (Cal was picked to finish 8th in the Pac-12) … hit 7-for-15 during the week while batting near the top of the lineup (cleanup or 2-hole), as Bears went 4–1 with Monday rivalry victory at Stanford followed by 4-game series vs. UC Irvine (which returns several top players from its 2014 CWS squad) … five of his seven hits during the week went for extra bases, with three home runs and a pair of doubles … drove in nearly one-third of the teams runs (10 of 33) during the productive week … introduced himself to the Cal-Stanford rivalry in stunning fashion, launching a grand slam in his first at-bat and adding a 3-run blast in the 4th to fuel that 11–1 win at Sunken Diamond … his top effort in the UC Irvine series included batting 2-for-4 with two RBI, a double and a home run in the game-2 win (10–3) … Central California product, from Turlock High School. 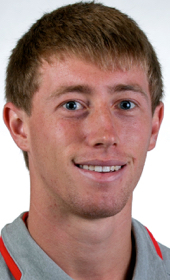 Indiana State … LHP … 5th-Yr.-Sr.
Houston … RHP … So. Rose to the occasion as game-1 starter in series versus Alabama (cb360 #29), logging 7.0 strong innings as the Cougars went on to win 3–1 and ultimately take the series … worked around seven hits by limiting the damage with only one walk, countered by five strikeouts in an outing that saw him locate 72% of his pitches for strikes (66 of 92) … kept his team in the game, with the decisive three runs coming in the bottom of the 6th … earned 2014 Freshman All-America honors after going 6–0 with a 1.87 ERA in 43.1 innings (33 Ks, 7 BB) for Houston team that won 48 games and reached the NCAA Super Regional round … in-state product from Livingston High School. Georgia … LHP … Jr.
Racked up 10 strikeouts in six strong innings against Florida State (cb360 #16), picking up the game-2 victory in 4–1 win that sparked doubleheader sweep to take the series … did not allow a baserunner into scoring position until the 5th inning, when FSU scored its lone run … limited potent Seminoles offense to four hits (three of them singles, one a bunt) and only two free passes, on a walk and hit batter … served as UGa’s Friday-night starter during 2014 SEC games, finishing with a 4–6 season record while often matching up against the opponent’s ace … spent his first season of college baseball at NAIA Middle Georgia (2013) … in-state product who earned honorable mention All-America honors at Calvary Day School. 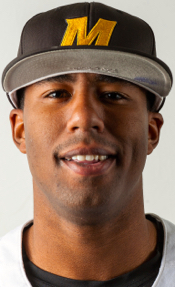 UCF … 2B/RHP … Fr. 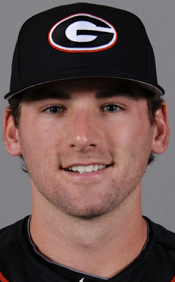 Starting second baseman and relief pitcher for UCF team that ended week-2 as one of only seven unbeaten/untied teams in all of Division I baseball – highlighted by wins over Maryland (cb360 #20) and  Arkansas (both at South Alabama) … racked up eight RBI during 4–0 week, while batting .385 with a home run and double, in addition to logging a pair of scoreless relief outings … reached base 11 times during the week, with six bases on balls … drove in two runs from the 7-hole in 9–5 win over Arkansas, while reaching base four times (double and three walks) … helped edge the Terps the next day, 7–6, with a walk and run scored while retiring the final two batters to pick up the save … closed the tournament with three RBI (2-for-5) in 7–5 win over the host Jaguars … during 10–2 midweek win over MEAC favorite Bethune-Cookman, went 2-for-3, walked twice, factored into four of UCF’s runs (3 RBI, 2 R, HR) and logged a shutout inning with a strikeout … southern Florida product from Spruce Creek High School. Missouri … RHP … Jr.
TCU … RHP … Sr. 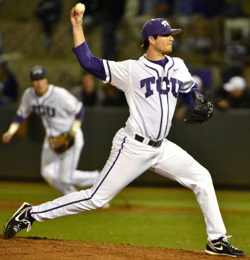 Veteran leader of TCU staff, after forming a potent 1-2 punch with LHP Brandon Finnegan on TCU’s 2014 College World Series team (Finnegan went on to pitch in the MLB World Series as well, with the K.C. Royals) … sparkled in the series opener versus Arizona State (cb360 #17), fashioning a three-hit shutout as the Frogs won 3–0 in Phoenix … worked around a couple baserunners in the first frame before yielding only two hits over the final eight innings … only one of ASU’s four baserunners ventured into scoring position, while Morrison retired 23 of the final 25 batters he faced … walked only one batter and struck out five, while returning 15 others via groundball outs … the big-game win was the senior’s 27th career victory at TCU, his eighth complete game and – most impressively – his fifth shutout performance. Grand Canyon … SS … Jr.
Hit nearly .500 (8-for-17) during unbeaten week, as Lopes – embarking on their second Division I season – posted four wins over cb360 top-50 teams: 7–0 at  UNLV and a series sweep at  Cal Poly (10–4, 4–2, 9–3), with the Mustangs featuring several top returners from their historic 2014 team … reached base 11 times during the week (2 BB, HBP) while factoring into 14 of GCU’s runs (7 RBI, 8 R, HR) … played lead role in the shutout win at UNLV, highlighted by two-run blast for first home run of his college career (2-for-4, 3 RBI, 2 R, HBP) … reached four times in opener at Cal Poly (3-for-4, BB) and factored into half of the team’s 10 runs (3 RBI, 2 R) … also hit safely in gm-2 before closing the week batting 2-for-5 in the series finale (RBI, 2 R) … second-year starter who swiped 20 stolen bases in 2014 … started his college career playing for GCU on the Division II level … the Lopes are expected to challenge Sacramento State for the 2015 WAC regular-season title, but – as a DI transitional team – GCU will not be eligible for any postseason play until 2018 … in-state product from Liberty High School. Kent State … SS … Sr.
One of the few remaining regulars from Kent State’s 2012 College World Series team, looking to help the Flashes contend for the 2015 MAC title and take another crack at reaching the CWS … nearly led team to series win at Baylor (cb360 #43), after the Bears could find few answers in keeping him off the basepaths during that three-game series … his .813 series on-base pct. 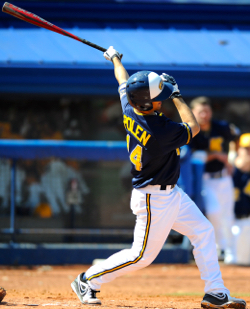 – all the more noteworthy when considering that nine Kent State players had to miss the doubleheader due to illness – included batting 6-for-9 with six walks and a 13th time on base via a hit-by-pitch … reached base five times (2-for-3, 3 BB, RBI, 2 R) in 11–3 series-opening victory … opened Saturday doubeheader with four more times on base (3-for-4, BB) in 6–1 loss … his five times on base in the series finale (1-for-2, 2 BB, HBP) ignited a comeback and he appeared to score the series-winning run in the top of the 10th, but Baylor rallied for the 4–3 final … also played error-free at shortstop throughout the series … four-year starter who hit .312 as a sophomore in 2013 … collected three hits in there games at the 2012 CWS … in-state product from Triway High School. Switch hitter who batted at a .444 clip (8-for-18) during four-game week while helping the Gators win the three-game weekend rivalry series versus Miami (cb360 #11) … made key contributions all week from the 2-hole – ranging from four RBI and three runs scored to four stolen bases and even a pair of assists from his spot in center field … in tight 4–3 opener against the Hurricanes, hit 3-for-5 with a pair of stolen bases while scoring to tie the game in the 6th inning, in addition to later gunning down Miami’s own potential tying run in the 8th – and finally delivering the single that scored Josh Tobias for the thrilling win … two days later, in the low-scoring series finale (a 2–1 Gators win), he tied the game with a clutch, two-out single to right field in the 3rd inning … prior to batting 5-for-12 in the showdown against Miami, with hits in all three games, went 3-for-6 with a pair of RBI, two runs scored and a couple stolen bases in 13–3 win over South Florida … primarily a starting corner outfielder as a freshman in 2014 but has unseeded Harrison Bader as the Gators starter in center field this season … was a three-sport standout at St. George’s School in Middletown, R.I. – but not in the usual football–basketball–baseball combination, but rather soccer, hockey and baseball. 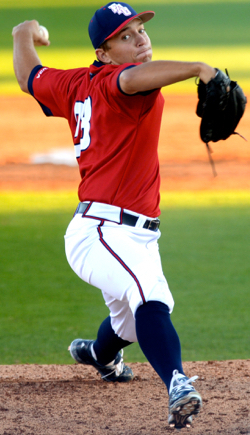 Florida Atlantic … LHP … Jr. Took 2–0 career record versus Miami into early-season game vs. the Hurricanes and delivered another quality outing, with this six shutout innings setting the stage for FAU’s 5–3 comeback victory over the ‘Canes (cb360 #11) … worked around jams in the first two innings, ultimately registering 13 of his 18 outs via strikeouts (4), groundballs (7), foulouts (1) or infield popups (1) … overcame a teammate’s 1st-inning error to leave the bases loaded (ending with an infield popup) and then worked around a couple two-out singles in the 2nd … kept Miami from crossing home plate, while scattering five hits, three walks and a hit batter over the 6.0 innings … logged 41.1 innings over 17 appearances in 2014, after making seven starts among 13 appearances in 2013 … south Florida product from Park Vista High School. 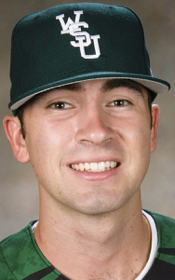 Wright State … RHP … Jr. 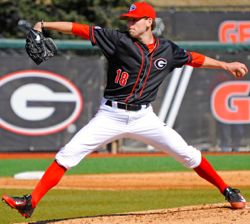 First-year starter who sparkled in near-complete game against Louisville (cb360 top-50), logging eight shutout innings as Red Wolves posted 4–1 win to clinch series (in Emerson, Ga.) … limited the damage by facing only 29 batters (five over the minimum), allowing two singles, a pair of walks and two hit batters while striking out three in the 92-pitch outing … kept 14 of his 18 outs in the infield, with five groundouts, four infield popups and a double play via an infield lineout (plus the three Ks) … made 24 appearances, all in relief, as a freshman in 2014 … in-state product from White Hall High School.